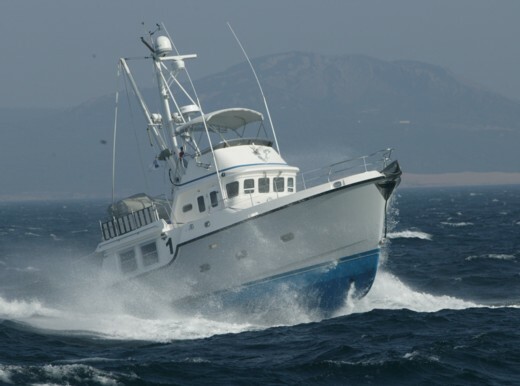 We host four different interactive mailing lists about trawlers and trawlering and one new list about power catamarans. For information, click here. 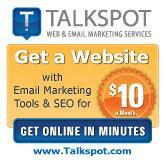 If you prefer Web-based forums, click here. Show your passion. 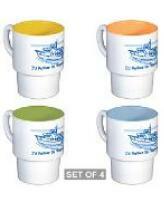 Purchase Trawlers & Trawlering shirts, logbooks and other gear by clicking on the above graphic. Click here to order the original burgee for trawler crawlers everywhere. Chopper no longer needed . . .
. . . to get awesome shots like this of your yacht under way. The solution is your own flying camera--on a quadcopter drone. That's the power catamaran Hero in the photo. READ MORE . 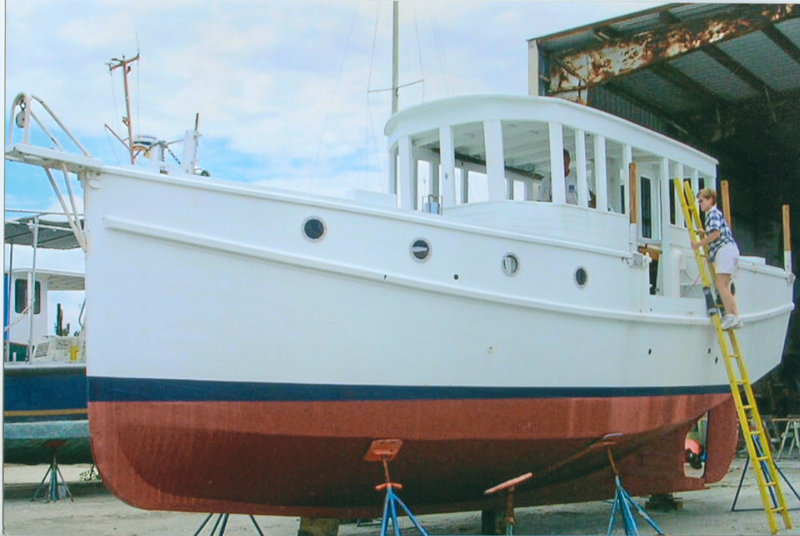 . .
Mark Richter has sold Winnie the Pooh, the superb sailboat-to-trawler conversion that he created 17 years ago from a Heritage West Indies 46 hull. 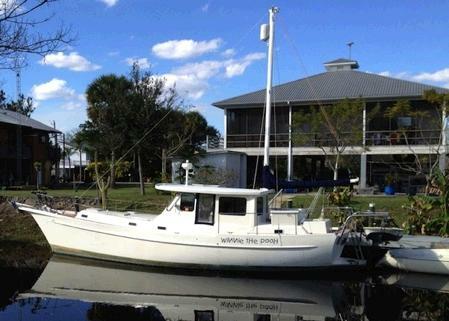 But Winnie won't move far as the new owners also purchased a house with a dock a few doors down Turkey Creek in Ortona, Florida, from Mark. READ MORE . . .
At last, a personal boating book written by a professional writer. 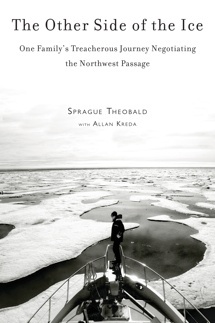 When Sprague Theobald set out to transit the Northwest Passage—the sea route connecting the Atlantic to the Pacific—he had no idea just how life-changing his journey would be. 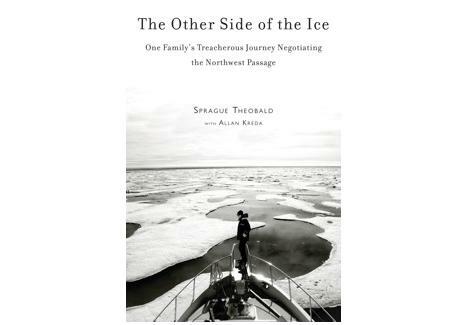 Follow the 8,500-mile trek filled with constant danger from ice, polar bears, and severe weather in The Other Side of the Ice, the new book written by the award-winning documentary filmmaker and author. READ MORE AND ORDER HERE . . . The DeFever 41 Escargot on the hook in the Bahamas. 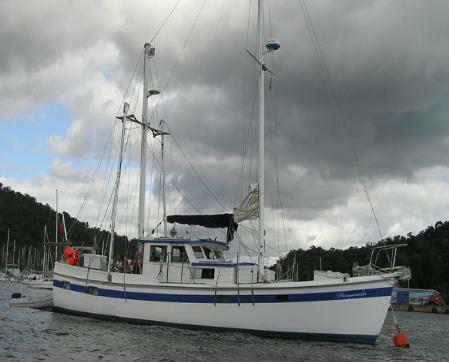 Escargot, a DeFever 41 equipped with Naiad stabilizers, is the newest posting in Trawler Buy-Sell-Trade on TrawlerCrawler.net. If you have a power cruiser to sell, post the information with a photo there for free. READ MORE . . . 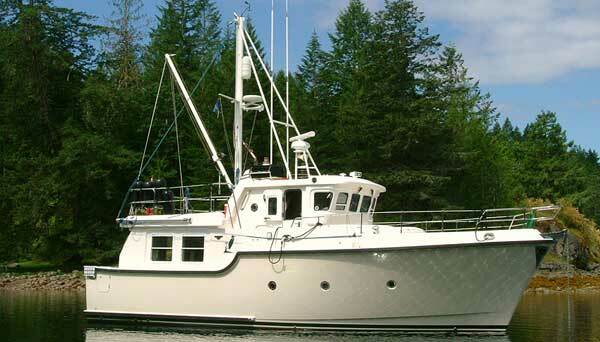 When the Nordic Tug 26 prototype was introduced at the 1980 Seattle International Boat Show, it caused a frenzy. In those years of soaring fuel costs, it was the right boat for the times. With an introductory price of $29,995 and a reserved spot on the production line available for a $1,000 returnable deposit, buyers couldn't help themselves. Thirty-seven--one every three hours--were sold at the show. 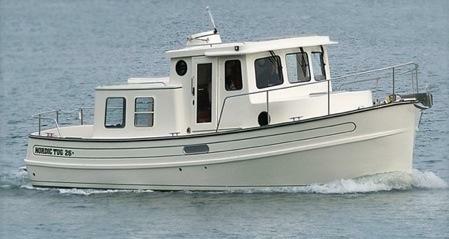 By 1997, the 26 was retired as Nordic Tugs built ever larger boats to meet consumer demand. Now, the company is betting the times are again right for a power cruiser that will sip less than one gallon per hour at six knots. READ MORE . 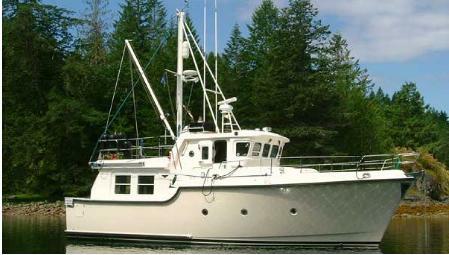 . .
A Nordhavn 40 is the newest offering at Trawler Buy-Sell-Trade at TrawlerCrawler.net. 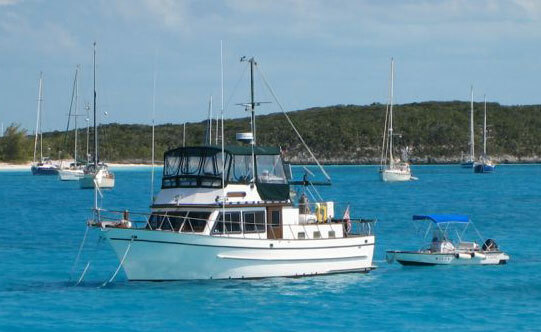 If you have a boat for sale, for trade, or that you want to buy, you can post a listing for free. 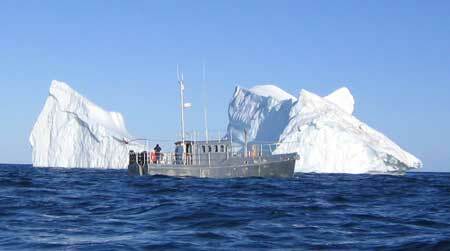 After clearing the Northwest Passage, Idlewild encounters one of many icebergs sailing in Baffin Bay. Photo by Kevin Gray from on board the tender Sidekick. You have followed along with us at Trawlers & Trawlering about the 329 day circumnaviagation of Idlewild which was completed in June of 2006. Alberta rancher Ben Gray along with his sons spent 202 days at sea circumnavigating west to east via the Northwest Passage. READ MORE. . .
Take a trip around the world with Ben in his book An Incredible Journey - The Idlewild Expedition. The book can be purchased by ‪clicking here. With the summer cruising season in full swing, cities from Maryland to Florida are considering or are in the process of implementing restrictions on anchoring, both for transient and local boats, according to a Waterway Guide update. 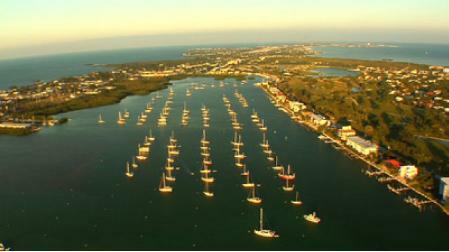 In many cases, the restrictions are in response to problems directly caused by derelict boats in harbors. READ MORE . . . 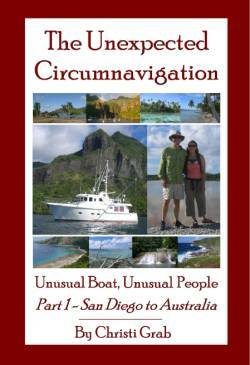 The Unexpected Circumnavigation, Part 1, now is available at Lulu.com. 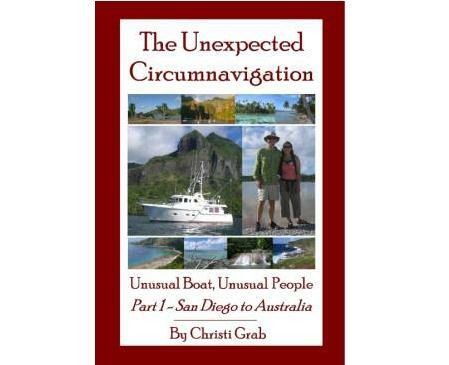 The round-the-world adventure by Christi and Eric Grab aboard the Nordhavn 43 Kosmos will be the subject of four print-on-demand books authored by Christi Grab. The first volume covers the voyage from San Diego to Australia. READ MORE . 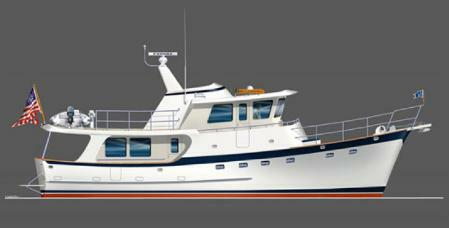 . .
Five orders for the Krogen 52 were received within 10 days of the new model's introduction. Ten years after introducing the Krogen 58, Kadey-Krogen Yachts has unveiled a smaller sister ship, the Krogen 52, which offers many of the same design elements with its raised pilothouse and spacious living areas. Tooling for the all-new model will be completed by the fall at Asia Harbor Yacht Builders in Taiwan, with the first hull arriving in the United States in mid-2011. PRESS RELEASE . . .
Larry Briggs took Champion around the world in 1977-80. Champion, the 52-foot custom design by William Lapworth that was the first trawler yacht to circumnavigate the world, is for sale in the Chesapeake. Larry Briggs, who went on the voyage around the world three more times in other powerboats, had Champion built in 1959 and took her around in 1977-80. SEE THE LISTING . . .
On the final morning of Nordhavn Atlantic Rally 2004, as the fleet approached Gibraltar, Mother Nature asserted herself with a gale on the nose. 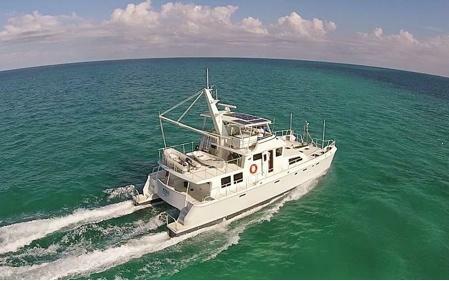 This dramatic photo of Uno Mas, a Nordhavn 40, was taken by Ken Williams aboard his Nordhavn 62 Sans Souci. When we look back over the last 10 years, the Nordhavn Atlantic Rally in 2004 jumps out as the biggest trawler news story of the past decade. It had everything: adventure, human interest, an element of risk, humor, mechanical issues, travel, great fun—all the elements that make trawlering so special. READ MORE . . .
A cutaway drawing makes it easy to see how the interior of a yacht is arranged. Why don't all boatbuilders use cutaway drawings to show off interiors to prospective customers? In this age of computer-aided design, it's relatively easy to do, as illustrated by Aventure Power Catamaran with its new Passagemaker 50. Click on the image for a larger view. READ MORE . . . The crew of the Nordhavn 57 Bagan takes a close look at icebergs south of Disko Bay, Greenland, while Sprague Theobald captures footage for his upcoming documentary. 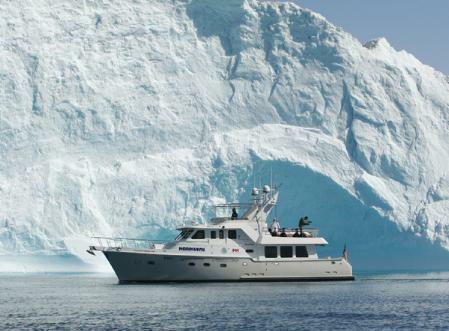 Filmmaker Sprague Theobald has completed a five-month voyage from Newport, Rhode Island, to Seattle that saw Bagan, his Nordhavn 57, transit the treacherous Northwest Passage across the top of the Americas. READ MORE . . .
Jill and Rudy Sechez prepare to launch Briney Bug and start cruising. No radio, no telephone and no insurance—and that only begins to tell the story of Briney Bug, a 34-foot, 42-horsepower troller yacht designed and built by Rudy and Jill Sechez for under $100,000. READ MORE . 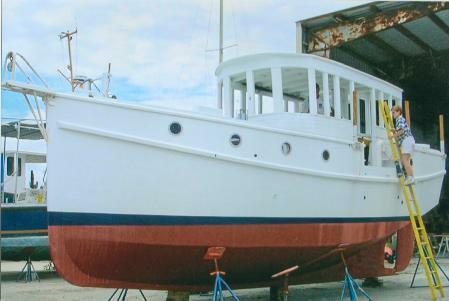 . .
Beebe's original Passagemaker has found a new owner in Trinidad where the old girl had languished on the hard for several years. The photo was taken on Chaguaramas Bay by John Camm of the Skookum 53 Seahorse shortly before his passing. 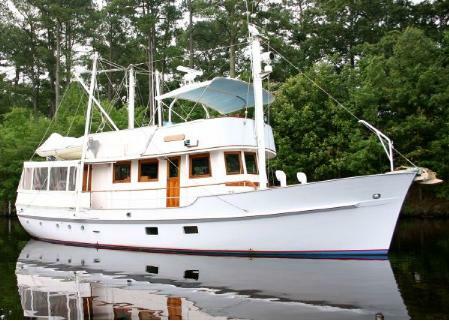 We'll post additional photos after we can arrange a tour of the classic trawler yacht. READ MORE . 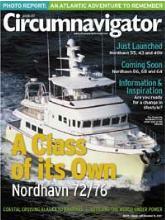 . .
Circumnavigator is an information-packed magazine on passagemaking under power sponsored by Nordhavn. For more information, please click on the above image.